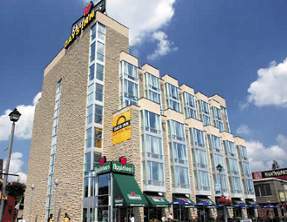 Staying at the Days Inn Niagara Falls, Canada – is the perfect hotel for a Niagara Falls vacation. Situated only steps from the “Hill of Fun” at Clifton Hill, minutes away from all the unique attractions along the Niagara Parks and across the street from the Casino Niagara, the Days Inn Clifton Hill provides guests with ideal location in Niagara Falls Ontario. The hotel is also features fabulous dining from Remington’s of Niagara & Applebees Neighbourhood Grill & Bar, located on-site. Inspired by the open feel of Montana, the Remingtons of Niagara has an attractive & relaxing western motif. The restaurant boasts a casual yet elegant style of dining in Niagara Falls, Canada for romantic and family patrons alike. Located in the heart of the Tourist Area of Niagara Falls Canada, the award winning Remingtons of Niagara restaurant is Niagara’s Finest Steak & Seafood Restaurant. By using the finest and freshest ingredients for every meal prepared, Remingtons of Niagara is the perfect choice for Niagara Falls dining. Located in the hotel lobby is the Family favourite Applebees Neighbourhood Grill & Bar. This Niagara Falls restaurant is now open on-site for breakfast, lunch, dinner and late night snacks. With a menu to please any palate, signature steaks and ribs Applebees offers all you want in Niagara Falls Canada.